The basic premise of a Pendley Farms Fund Raiser is for you and your youth group to come pick Blueberries and have an adventure together in the great outdoors. You leave Pendley Farms with fresh Blueberries to deliver to your customers that have pre-ordered from you. There are 2 Blueberry Options: a. you pick and deliver b. we harvest the berries for you, you pick them up from us and then deliver the fresh berries to your customers. We will be glad to work with you and your organization on which option is best for you. Contact us for more specifics regarding prices and details of how the two options can best work for your organization. Our goal is for your organization to receive a 50% return on the selling price (if you pick the Blueberries). Benefits to your organization: Great product! - see our information at the “Berries and Lilies” tab for more information. (3) Blueberries have excellent “keeping” qualities to include easy to freeze and use later! (4) Fun, outside event for your youth group. Option 3. Day Lilies: We also have Stella de Oro Daylilies for your organization to sale. You will be provided with order forms, and we will package the daylilies for you to deliver to your customers. We will work with you to develop the best plan to meet your needs. (1) We developed our small farm plan around two products that are tried and true to us. (2) Stella de Oro Daylilies are one of America’s favorites for their hardiness, long blooming season, and rapid multiplication. (3) We also plan to have old fashioned “Tiger Lilies” available in the future for the same reasons! Summary If you are a group leader in any fashion that has been involved with, and is tired of, car washes, magazine sales, coupon books, and trinket sales for fundraisers - think of trying this unique fund raising opportunity that provides high payback, outside fun, and a product that people will actually want and use! Pendley Farms will work with you on developing a plan that is right for your organization. 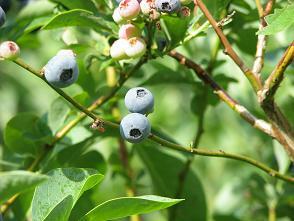 We look forward to this year's crop of Blueberries in the Summer!